I’ll be writing some basic neuroanatomy posts over the coming months (I started with my previous post about the corticospinal tract). I recently finished an intense neuroanatomy course where I learned how much I love basic neuroanatomy. It’s exciting to look at a brain or brain slices and try to figure out what and where different structures are. In the early 1900s Korbinian Brodmann studied the cytoarchitecture (organization of the cortical layers of neurons) of human and non-human brains. His work was painstaking and thorough. He created a topographic map of the cortex containing 52 (50 in humans) different areas. In my class we were not required to learn all of Brodmann’s cortical areas but had to learn some of the major ones. 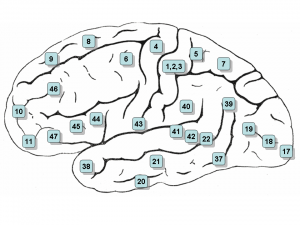 Brodmann’s Areas (BA) 3,1, and 2 compose the primary somatosensory area of the brain. BA 4 is the primary motor cortex. BA 5 is somatosensory association cortex just posterior to BA 3,1,2. BA 6 is pre-motor cortex, which connects directly to BA 4. BA 7 is more somatosensory association cortex that lies just posterior to BA 5. BA 8 is the frontal eye fields, which among other things is responsible for initiating horizontal eye saccades (i.e., quick movement to the left or right). BA 17 is the primary visual cortex, a credit card sized area that lies both dorsal and ventral to the calcarine fissure in the occipital lobe. This area processes most of the basic visual information. BAs 18 and 19 are visual association cortices. BA 22 is Wernicke’s Area, which is involved in the comprehension of language and is in the dorsal-posterior temporal lobe on the border between the temporal and parietal lobes. BAs 41 and 42 are the primary auditory cortex, which processes auditory information from the cochlea; this lies on the transverse temporal gyrus in the dorsal part of the temporal lobes (it is hidden from view unless the cortex around the Sylvian Fissure is pulled away). 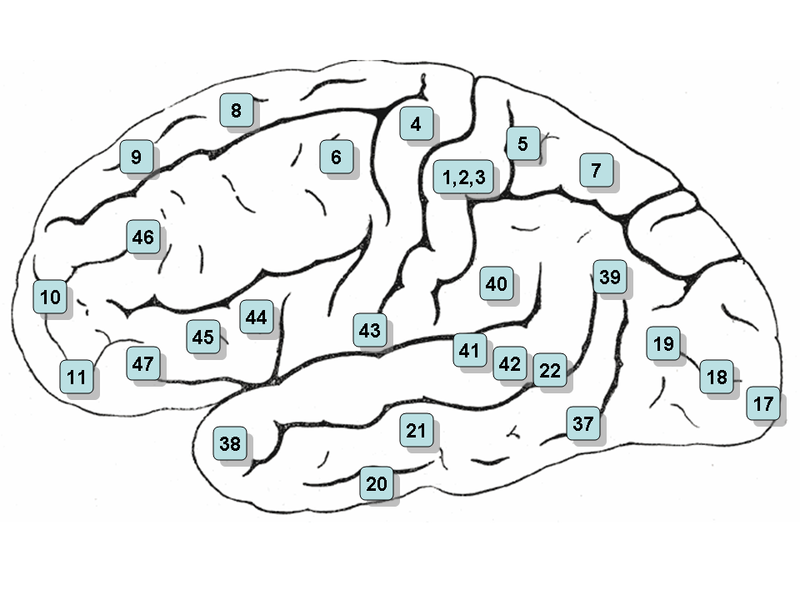 BAs 44 & 45 are Broca’s area, which is involved in the production of language and is in the lateral frontal lobes.